Toss the beef with the salt, pepper and some super fine flour to coat. Set aside. 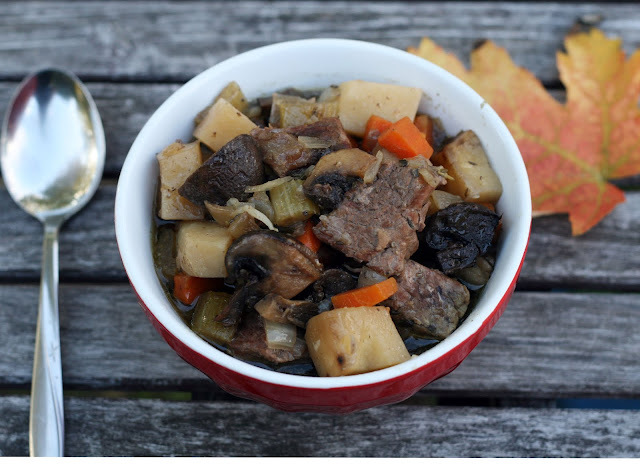 Heat some olive oil in a Dutch oven and add the beef, carrots, potatoes, mushrooms and herbs. Saute until the beef is lightly browned on all sides and the vegetables are just beginning to soften. Pour the mixture into a 6 quart slow cooker. Add the stock and bay leaf. Cover and cook for 8 hours. Remove the bay leaf prior to serving. Stir. Growing up my grandpop always made beef stew. The ingredients always varied because I think he was trying to use up odds and ends and but it was always tasty! He was his hardest critic though because every time he made it he'd say it was better some time before and then tweak it again. I'm sort of the same way, I guess. Stews I've made in the past have always been quite tasty so I'm not trying to improve on them as much as I like to make something new each time. I like variety and honestly, developing and posting recipes for Coconut & Lime (over 1,450 to date) can be a daunting and somewhat grueling task. If I kept making the same thing over and over again, I'd never have anything post! For this beef stew I took a page from Grandpop and used what we had in the house for the most part. I had rosemary and thyme leftover from other recipes, I always have potatoes, carrots, garlic and celery and I had an enormous box of mushrooms I bought at Costco that had to be used. So I added lots of mushrooms and only had to pick up the beef to round it out. I was careful to cut everything roughly the same size as the beef so it cooked evenly. I was a little worried the rosemary might overwhelm as it is wont to do but it mellowed during cooking and gave a pleasant herbal note to the hearty, rich stew. Preheat oven to 350. Spray with cooking spray or grease a 8x8 inch baking dish. Melt the butter in a large skillet. Add the celery and onion and saute until the onion is translucent (do not brown! ), about 5 minutes. Add the bread cubes and saute until they are warmed through. Add the mixture to a large bowl. 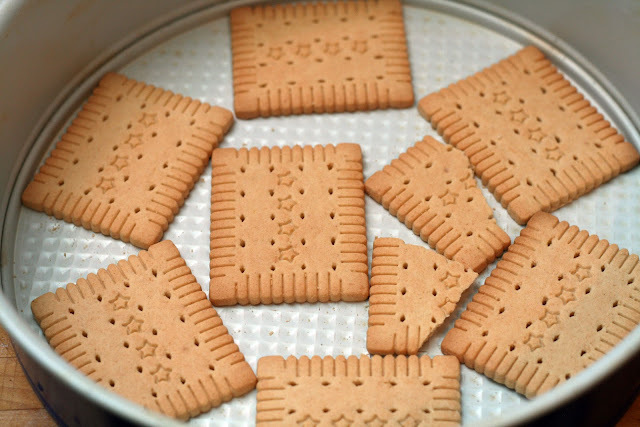 Stir in the remaining ingredients until all ingredients are evenly distributed*. Pour into the prepared pan. Bake for 30 minutes or until piping hot and the top is lightly browned. *Some mashed potatoes are moister than others. If your mixture looks dry, add some chicken or turkey stock to moisten and thin the mixture out a bit. I came across a mention of potato filling in an article about Thanksgiving traditions and regional foods people miss when they move from their hometown. We all know how fond I am of sauerkraut at Thanksgiving so any mention of a quirky regional dish catches my attention. Apparently this is often served at Thanksgiving and sometimes even stuffs the turkey (!) but I thought it was a great way to use up the leftover mashed potatoes that, let's face it, often get dumped. 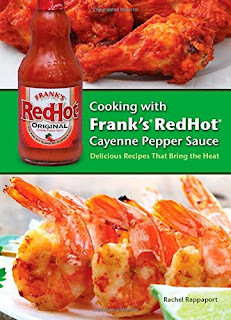 You probably still have some turkey to serve with this but if not, ham or chicken would be tasty too. 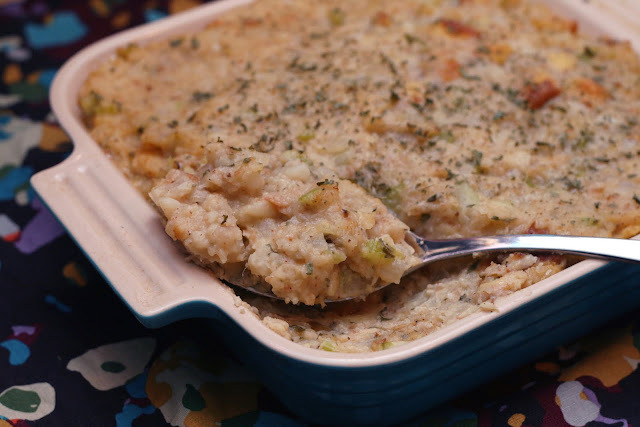 It is like a crazy homey hybrid of stuffing and mashed potatoes. I took care not to overcook the celery so it provided a good crunch, breaking up the creaminess of the potatoes. It might be a bit homely looking but it is so good and this is coming from a truly rare casserole eater. Whisk together the dressing ingredients. Refrigerate until ready to use. 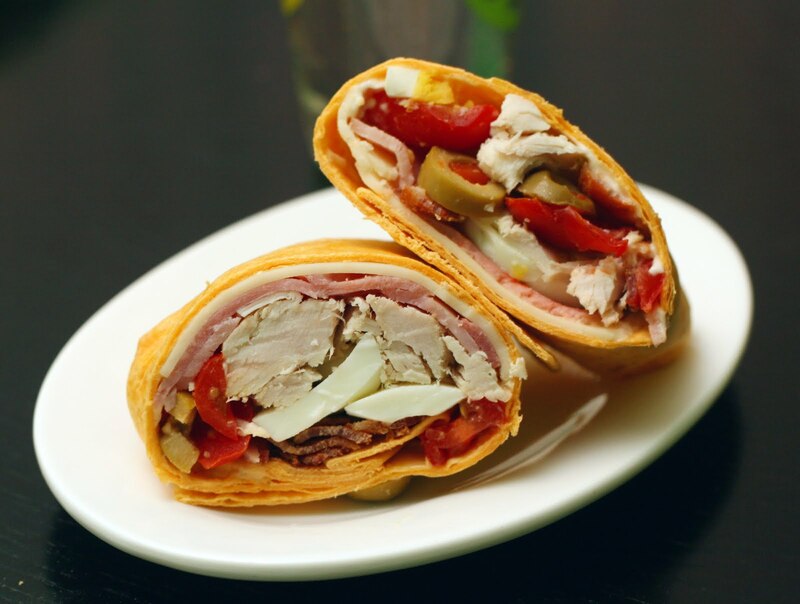 Spread one side of each roll with the Cobb spread. Top with a thin layer of Romaine. Layer the egg, turkey, tomato and avocado on one side then top with watercress then sprinkle with chives if using. 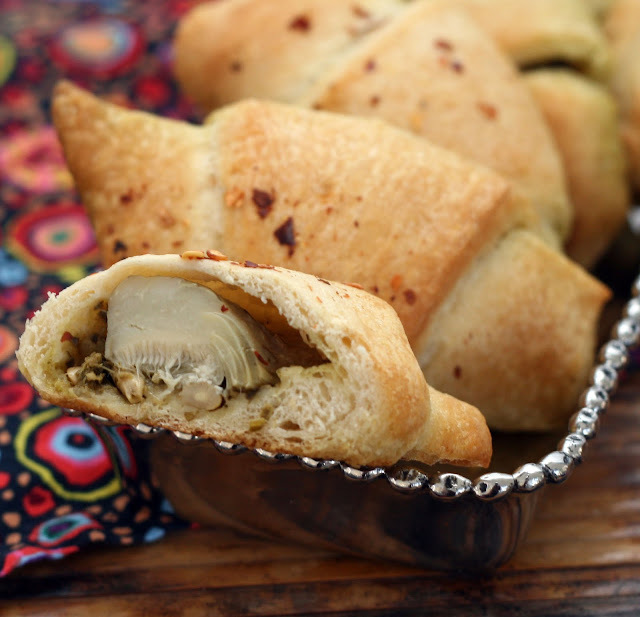 Thanksgiving leftover recipes are perhaps the recipe I look forward to creating each year. While I love the leftover turkey and cranberry sauce sandwich as much as any one, coming up with clever alternative sandwiches and other recipes is always a fun challenge. This year, I wanted to use up leftover turkey, Gorgonzola (from my awesome Brussels sprouts dish), some salad odds and ends and bacon leftover from breakfast. My first thought was to make a big salad but then I got to thinking about how it is common to see a Caesar salad-inspired sandwich or wrap but never the Cobb. I think the Cobb makes more sense than Caesar as a sandwich. 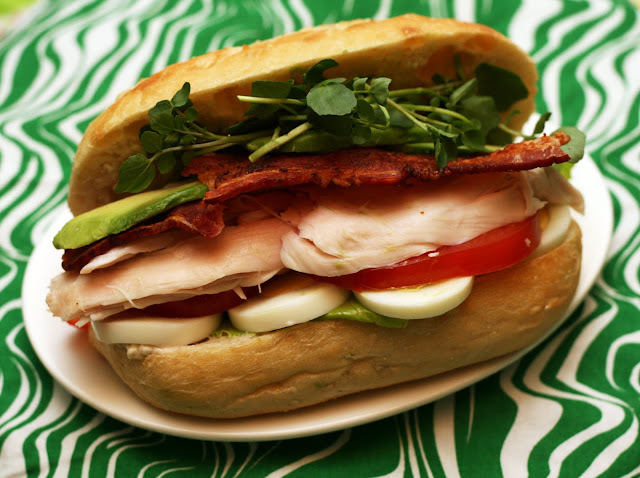 It naturally has more sandwich-friendly ingredients like chicken, avocado, tomato and lettuce than the pretty much just lettuce Caesar. 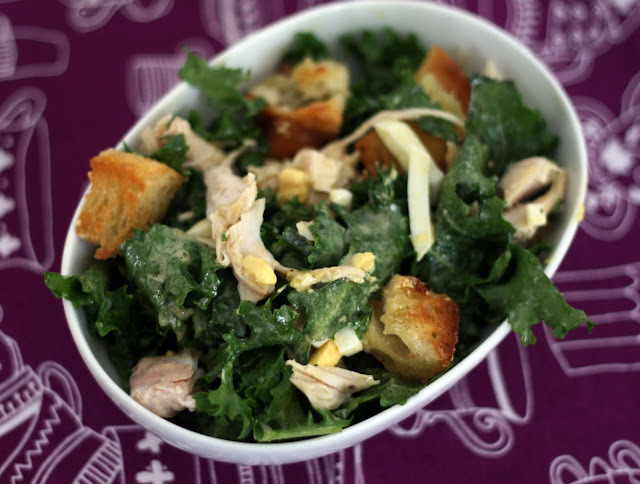 I subbed turkey for the traditional poached chicken and made a creamy spread using similar ingredients to the famous Cobb dressing and the Roquefort that normally tops a Cobb salad. The spread was much better suited for a sandwich than a thin vinaigrette. YUM! Perfect use of leftovers for turkey sandwich lovers but not the same old, same old. Check out my other Thanksgiving leftovers recipes here and look for three new leftover-using recipes later this week! Place the cranberries, juice, sugar, and zest in a medium saucepan and, stirring occasionally, cook for 20 minutes over medium high heat to reduce and thicken. Remove from heat and stir in the slivovitz. Serve hot or cold. On the original Iron Chef, the judges seemed fond of either saying something reminded them of their childhood or of their ancestors. 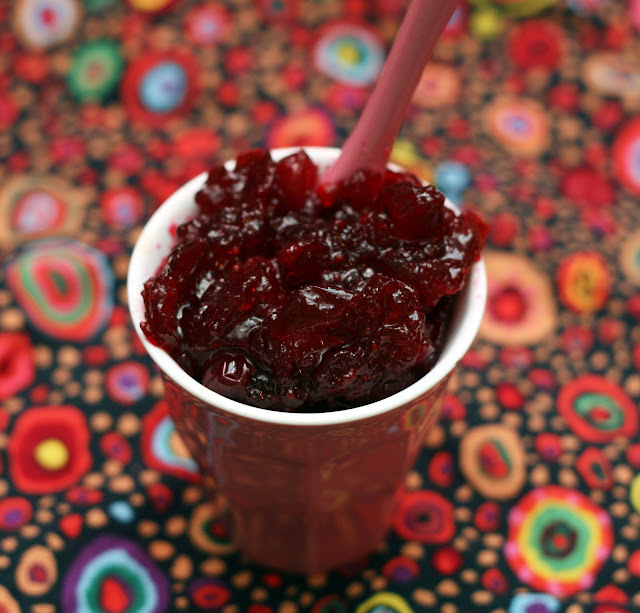 This cranberry sauce with the dollop of slivovitz reminds us of our Eastern European roots but with a very American twist: cranberries! Preheat oven to 400. Loosely stuff the turkey with the onions and apples. In a small bowl, whisk together the marjoram, olive oil, garlic and caraway seeds. Rub the mixture over the turkey. 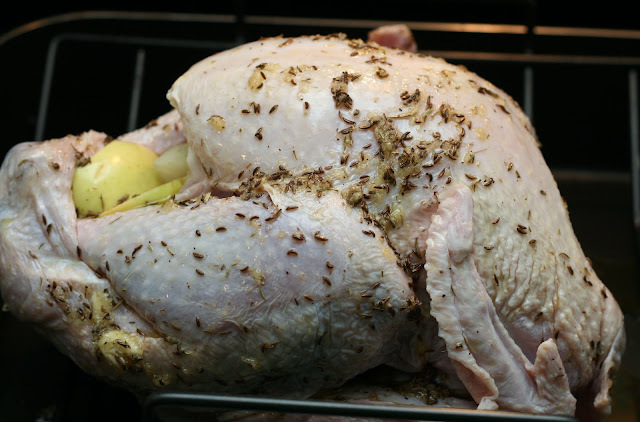 Roast the turkey for 30 minutes, then turn the oven down to 325 until done, about 2 1/2 hrs. Allow to sit 5 minutes before carving. 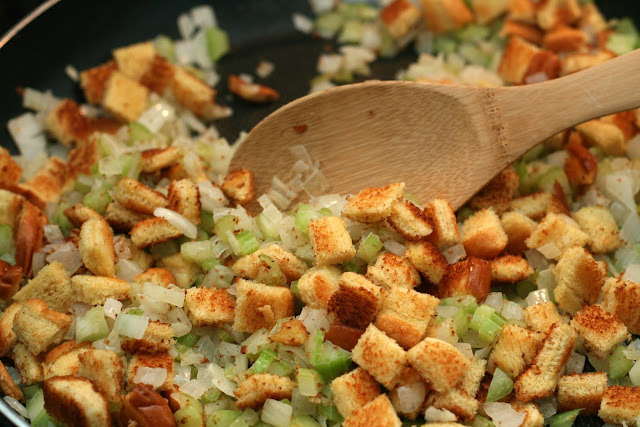 I came up with this recipe to coordinate with my Polish-American stuffing. I used a lot of the flavors found in Polish cooking especially the garlic in marjoram that is in my favorite sausage. 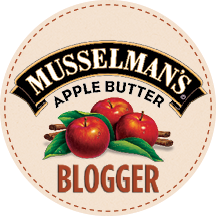 I think the apple keeps them turkey moist and lightly flavors the meat from within. I don't know if it is the spices I used or what but this was honestly the most beautiful turkey I've ever made. It was perfectly golden brown, the skin was crisp and it just looked like a picture from a magazine when I took it out of the oven. Amazing. The meat was juicy and flavorful as well. Perhaps my best turkey yet! In a large pan, saute celery and onions in butter and olive oil over very low heat until the onions are translucent. Do not brown. Meanwhile, lightly brown the kielbasa. Drain on paper towel lined plates if unnecessary. Add the celery onion mixture, kielbasa and the to bread cubes in bowl and add the spices. Combine with egg and stock. Form medium-sized balls. Refrigerate until ready to use, up to overnight. 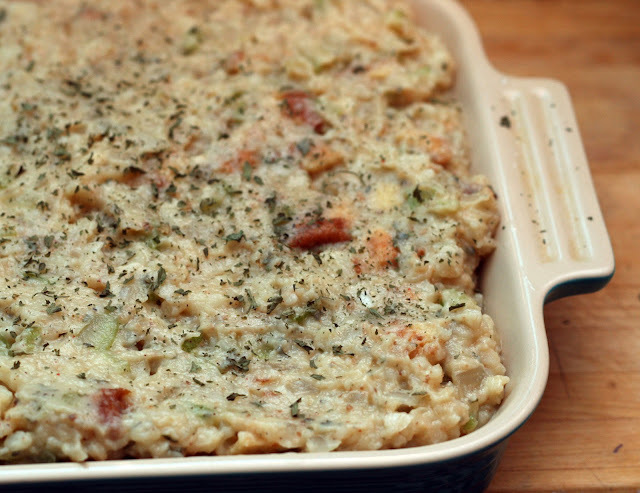 I think stuffing is my favorite dish at Thanksgiving. 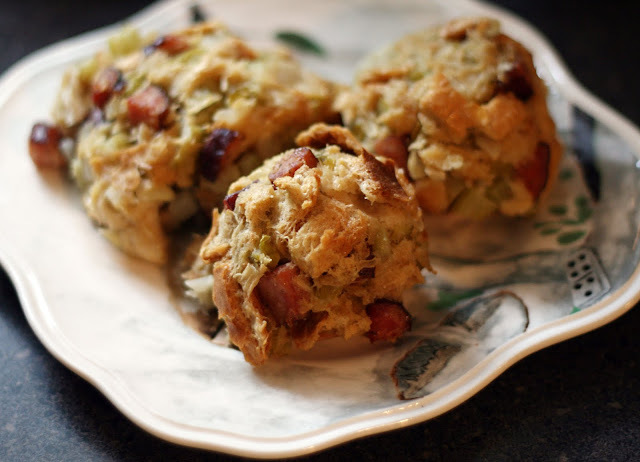 Growing up, we never stuffed the turkey or made a separate dish of dressing, we made balls of stuffing we sat round the turkey in the roasting pan and on the rack. 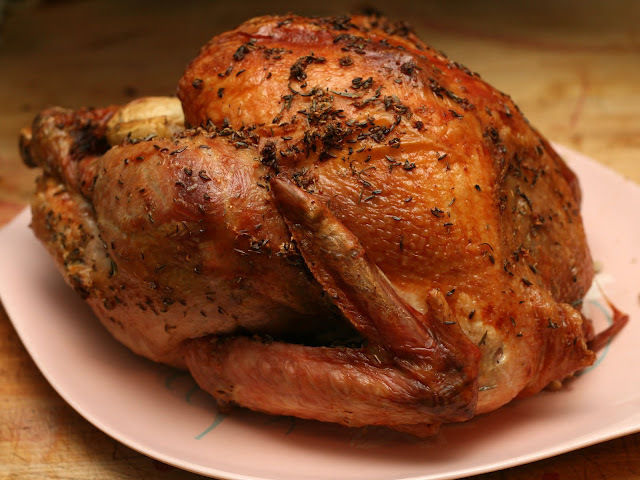 That way you get some of the flavor from the turkey but the turkey cooks more evenly than it does when stuffed. My mom still makes a pretty traditional version but over the years I've branched out. I've made thyme and portobello, oyster, rosemary sage, pecan, crimini mushroom, even Hawaiian bread & Spam. All delicous. This year I went Polish and and used a light rye instead of the usual sandwich bread and kielbasa to add flavor and Polish flare. Baltimore has a sizable Polish-American community (including members of my family) so it was easy to find Polish ingredients for the stuffing but any good supermarket or shop with a European foods section should have it. I was most excited find this sausage at the Broadway Market because I had already planned to season my turkey with garlic and marjoram. I love coordinating flavors and this was one of the best kielbasa I've ever had. Saute onion in the butter until soft and translucent. Shred the beets and add to the onion. Saute briefly to coat the beets in the onions. Remove to a bowl and add the remaining ingredients. Toss to coat. 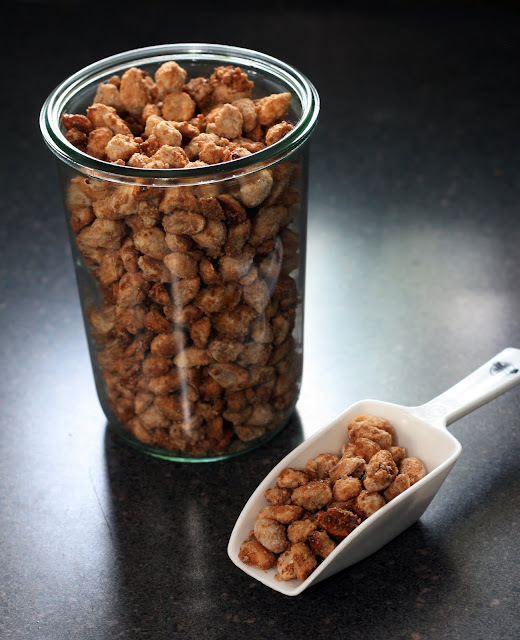 Serve warm or refrigerate 2 hours to overnight and serve cold. 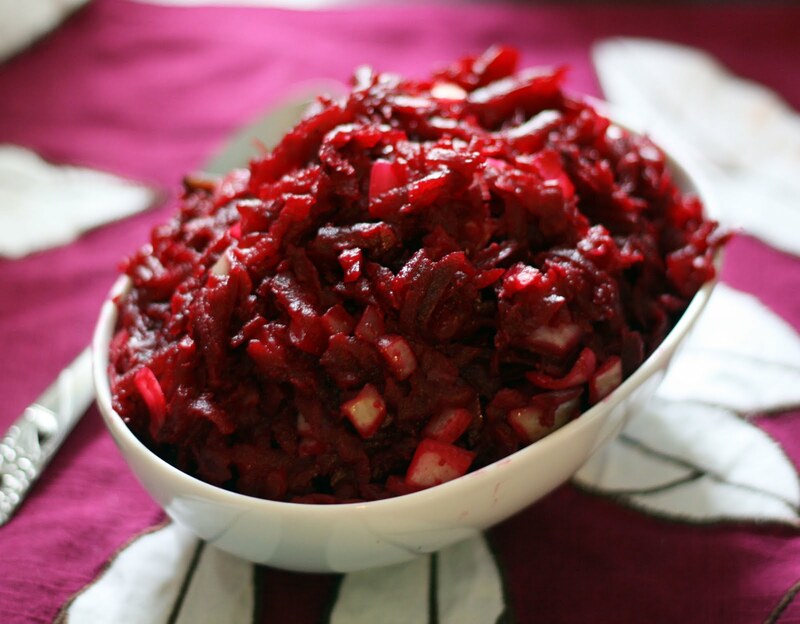 Continuing on our theme of Eastern European-inspired side dishes, I present the beet salad. I swear, every Polish cookbook, novel, blog and magazine I read during the planning for this year's Thanksgiving had at least 2 recipes for beet salad or at least, a character eating beet salad. I've never been to Poland but if I ever get there, I plan to eat beet salad as soon as I deplane. I kept it simple for this salad, just beets, lemons and onion but it is very, very good. Very beet-y but not earthy beet-y, more sweet, fresh vegetable beet-y. I saw recipes for beet salad that had you shred raw beets then cook them but honestly, that makes no sense to me. Beets are super easy to peel once cooked; the skin just slides off when you run them with a paper towel (no red hands!). The final texture of the dish is the same if you cook the beets before or after so why not save yourself some hassle. Another bonus to this recipe? If you want to serve it cold (I did) you can make it the day before and just whip it out when dinner is served. One less thing to worry about. Bring the stock and spices to a boil. Meanwhile, saute the onion, garlic and mushrooms until soft in a medium saucepan. Mix the kasha and the egg together in a small bowl. Add the kasha mixture to the onion mixture and saute until the kasha separates, about 5 minutes. Add the stock mixture, cover and cook until the liquid is fully absorbed, about 10 minutes. Stir. We've mostly had kasha in the form of Jewish classics kasha varnishkes and knishes but after reading Polish cookbook after cookbook and finding many mentions of kasha unrelated to either of those I thought it was time to branch out. As it turns out, kasha makes a wonderful side dish. 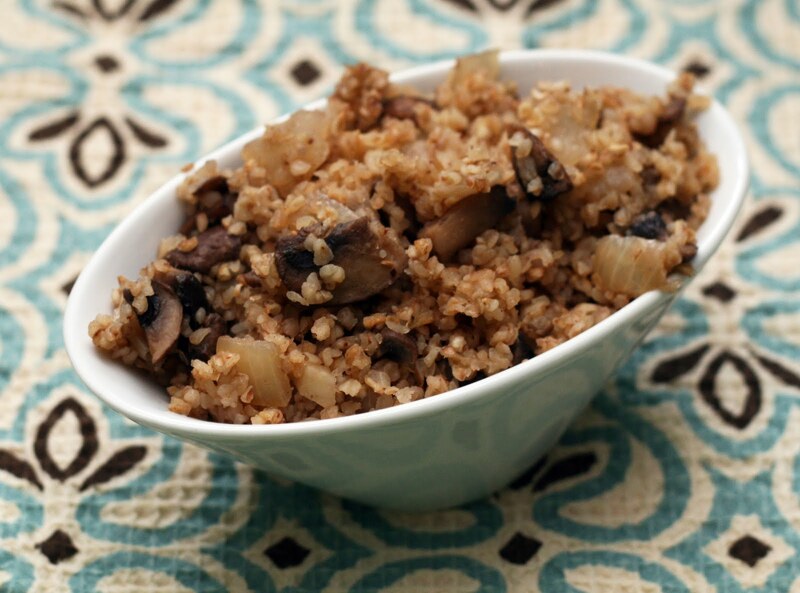 It is quick to make, naturally gluten-free and a inspired alternative to rice, wild rice or potatoes. 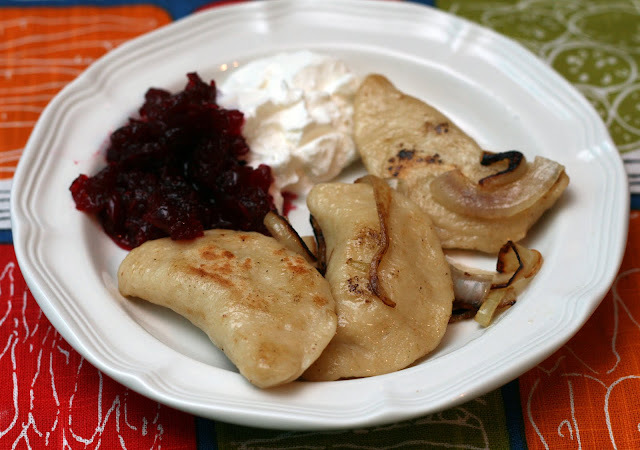 It is flavorful and hearty, perfect for an Eastern European-inspired Thanksgiving. Kasha by itself is kind of nutty flavored so adding the mushrooms really deepens the flavor. The egg is a bit of an odd ingredient but I swear, it is the trick to fluffy kasha. Cover and cook 5 minutes. Add the remaining ingredients. Bring to a boil, cover tightly and cook 45-60 minutes over low heat, stirring occasionally until the cabbage is well wilted. Stir before serving. This year for Thanksgiving we decided to get in touch with our roots. I had been tossing around many ideas for themes (I think this is my 8th year creating new Thanksgiving recipes for Coconut & Lime) and didn't really get excited about any of them until I thought of making Eastern European inspired dishes. It could be that cabbage is honestly one of my favorite foods and I love an excuse to cook with it! 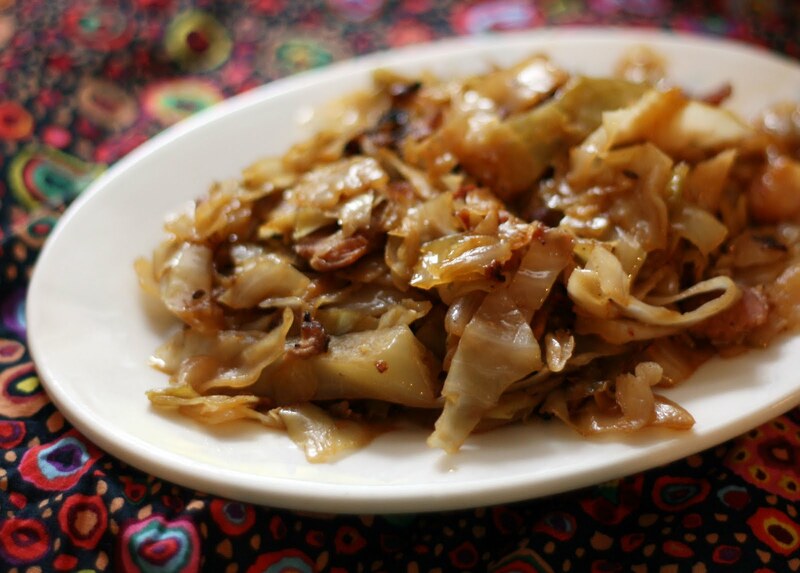 Sweet and sour cabbage dishes seem to be pretty popular in most Eastern European counties and I can see why. This one isn't very sweet (I've seen ones with tons of sugar and even fruit) but there is a hint of sweetness that contrasts with the tang of the vinegar. I thought it was the perfect dish for Thanksgiving because it was easy to prep (I find slicing the cabbage to be easier, quicker and less knuckle scraping than grating although you could grate it) and cooked forever with little interaction needed. It did get done slightly before I was ready to serve and it was just fine on the stove with the flame on the absolute lowest setting. 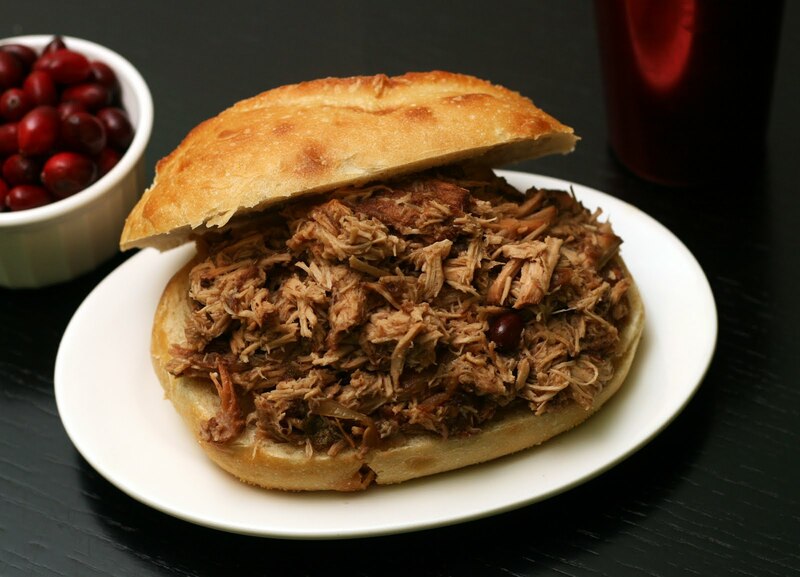 You could also keep it warm in a 4 quart slow cooker on warm or low if you'd like to make it earlier in the day. The results are amazing! The texture of the cabbage gets so soft, almost velvety after the long braise and is transformed into something even cabbage haters would enjoy. Preheat oven to 400. Grease or spray with cooking spray a 2 quart baking dish. Whisk together the milk and sour cream. Bring milk mixture, spices and garlic to a simmer in a large, high-walled skillet (I used a 14-inch cast iron skillet). Add potatoes, onion and squash continue to simmer, stirring occasionally, until potatoes and squash are fork tender, about 20 minutes. Remove half of the squash, potato and onion and arrange in the baking dish (I used my spider to remove the vegetables but a slotted spoon would do). Sprinkle with half of the cheese. Top with remaining potatoes, onion and squash. Add about 1 cup of the milk mixture to the baking dish (you should be able to see it but the vegetables should not be fully submerged). Sprinkle with the remaining cheese and bake 30-40 minutes or until hot and bubbly. All to sit 5-10 minutes prior to serving. Note: You could (carefully!) use a mandoline to slice the potatoes and squash if you want. I just used a really sharp knife and aimed for slices between 1/8 and 1/4 inch thick. I floated the slices in a bowl full of water until I was ready to add them to the milk mixture. This is a lightened up, squash-added twist on the classic French casserole potatoes Dauphinoise. November is the time for potato casseroles if there ever was one and I love cheesy potatoes but never, ever make them because they are time consuming and heavy and after all that, I still have to make a vegetable. Not my bag. So this year I was thinking of how I can make my cheesy dreams come true with minimal effort + maximum results. Adding winter squash was a no brainer because it can roughly be treated the same as potatoes (both dense, kind of starchy, similar cooking times) and it would eliminate my need to for separate vegetable*. I turned to the French for the technique and spirit but I used decidedly non-French extra, extra sharp cheddar as the cheese because I love it so. I think a good Gruyère would work really well too. 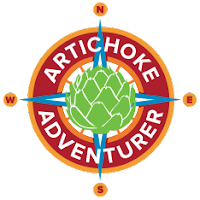 You need an assertive cheese or the whole thing comes out sort of bland and sad. Normally these sort of dishes are made with heavy cream which I never have on hand except when making ice cream so I subbed in my usual milk and sour cream and loved the results. Not as over-the-top rich but still creamy and with a sublte tang. The onions were my idea too, I love onions with potatoes and the boiling makes them mild and tender, perfect for this sort of comfort food. The simmering in milk step seems fussy but it ensures perfectly cooked, tender potato and squash. Plus when you add some of the liquid back in the baking dish, it is already infused with flavor. *I just made this on a random Thursday night but I think they would be so awesome served on Thanksgiving. You can even bake them ahead of time and just reheat them right before dinner. I've always wanted to make something with shredded Brussels sprouts but I don't have the knife skills for it (or the patience)so imagine my excitement when I went to a local grocery and right next to the whole sprouts were some sprouts that had already been shredded by a gifted store clerk. Score! I was going to saute them but then I wondered how they'd be raw. I have been known to sneak a bite of chopped Brussels sprouts before cooking but I'd never had them in a salad or anything like that. I figured it was worth a shot and I'm glad I tried it. It was delicious! One of those dishes that looks okay on paper (or on a screen) but is truly a delight to eat. All of the ingredients were both complementary and distinct at the same time. Almost like a wintery cole slaw. 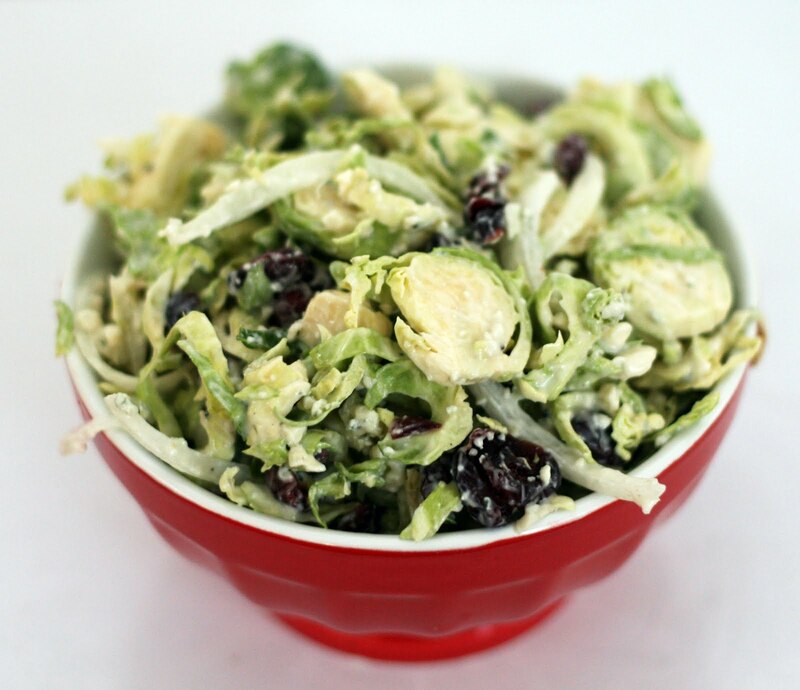 The perfect, crisp alternative to cooked Brussels sprouts. 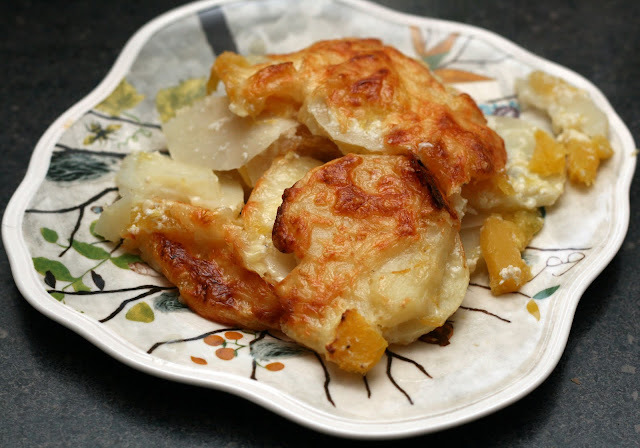 Melt the Brummel & Brown in a small skillet. Saute the apples and onion until the onions are translucent. 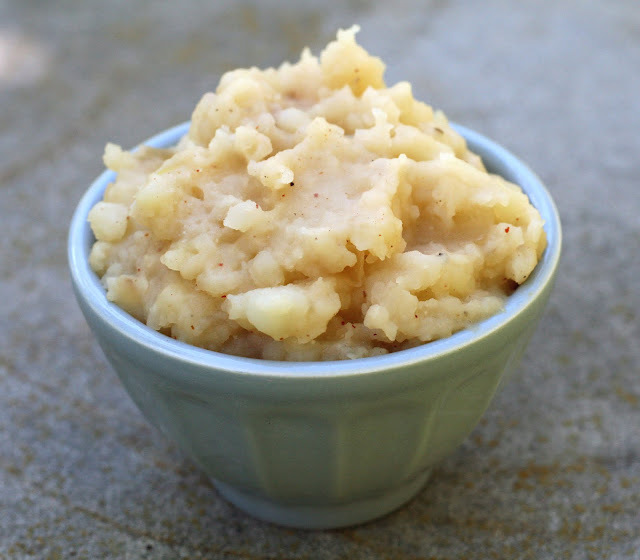 Whisk together the vinegar, sugar and mustard seed in the bottom of a 4 quart slow cooker until the sugar dissolves. Add the remaining ingredients. Stir to evenly distribute. Cook on low 8 hours or 4 hours on high. Serve hot. It isn't Thanksgiving in Baltimore unless there is sauerkraut! Thanks to an influx of German immigrants well over 100 years ago and who added very German sauerkraut to the very American holiday menu, everyone in Baltimore serves sauerkraut for Thanksgiving. Some even make it themselves! I've heard so many stories of people who grew up in Baltimore and didn't realize it was a regional quirk until going out of state for Thanksgiving for the first time. How disappointed they must have been! I admit, it seems a bit odd but sauerkraut pairs wonderfully with turkey and cuts the sweetness of some other side dishes. Personally, I like over my mashed potatoes and scooped on my fork when I am taking a bite of homemade jellied cranberry sauce. I've made a few different versions of Thanksgiving sauerkraut over the years but never a sweet-sour one. I came across a mention of a German dish that had apples, sauerkraut and wine in it and thought I'd pay homage to the inspiration of this tradition by adding apples to my dish. 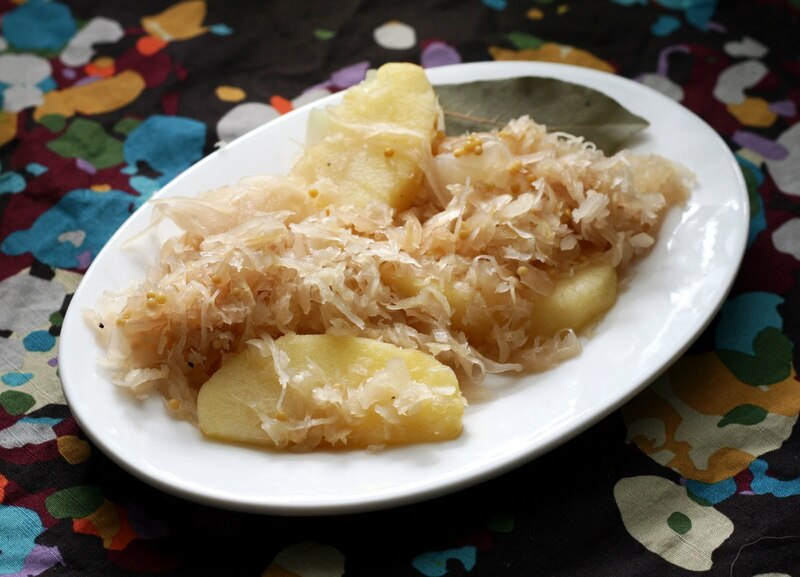 The apples cut the tartness of the sauerkraut which is already tempered by the long cooking time. 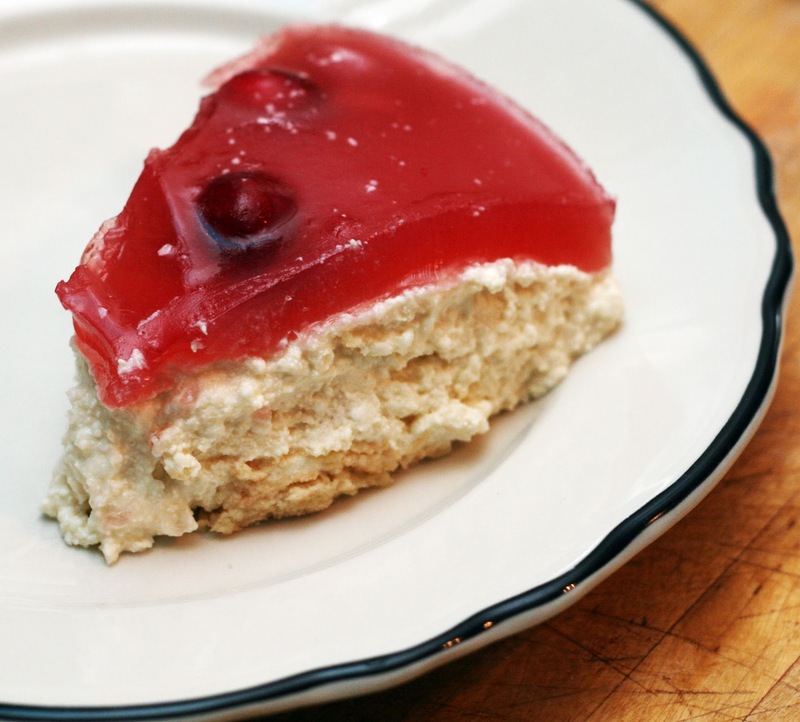 You could make this on the stove top (instead of popping it in the slow cooker, cook it over a low flame in a tightly-lidded Dutch oven for about 2 1/2 hours) but that takes up a lot of room on the stove that I need for making non-jellied cranberry sauce, gravy and vegetables.